One of the things I love the most about where I live in California is that we get such amazing produce, especially in the summer! There are farmer’s markets year-round here, but everything just seems to come in full force during the summer months and I just can’t get enough. This is my second year participating in a CSA program with a local farm here and I’ve been just loving getting a huge bag bursting with fresh veggies once a week. And one of the veggies that has been the spotlight lately is Swiss chard! I was recently talking to a friend about favorite dinner side-dishes and was shocked when she admitted she loves the idea of Swiss chard, but had no idea how to prepare it. Honestly, it can be a little boring simply steamed, but if you’re willing to get a little creative in the kitchen it is one of the most rewarding members of the green family! This recipe only takes about ten minutes to make, but the flavors are absolutely delicious and it would pair perfectly with just about anything you’re making. 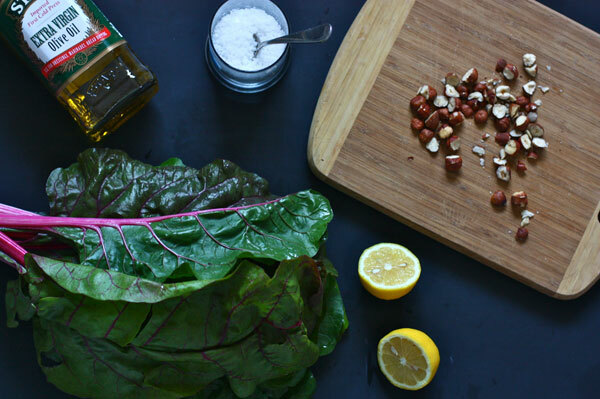 I love the addition of toasty hazelnuts to greens and with a burst of bright flavor from the lemon you’ll have a new favorite vegetable dish in no time. Farmer's Markets can provide great inspiration for new dishes. Jenna Weber of Eat, Live, Run shows how swiss chard can revitalize your veggie consumption. See the full post at the Fresh Tastes Blog. Wash the chard and roughly chop both the leaves and stalks. In a large skillet, heat up the olive oil over medium high heat. When hot, drop the chopped stalks and sauté for about five minutes until just tender. Add the leaves, hazelnuts and lemon zest and toss to combine. Saute briefly for thirty seconds until the leaves just begin to wilt. Take off heat and add the juice of half of the lemon and a small sprinkle of sea salt to finish. Serve with grilled chicken or fish. 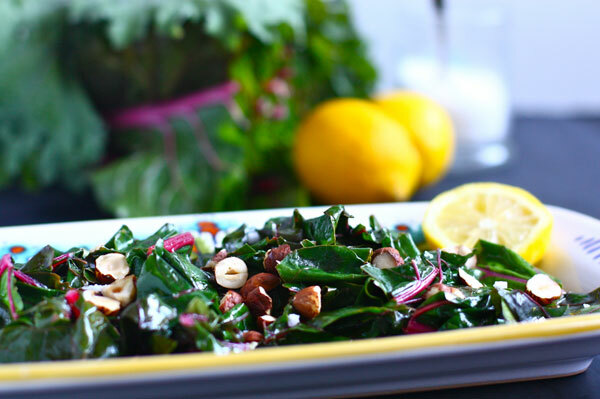 I made essentially the same thing last night for dinner, funny enough – lacinato kale, lemon, and toasted almonds. This combo sounds just as good, I’m definitely going to give it a try! I recommend adding in sauteed onion for some sweetness and a pinch of red pepper flakes for a bit of heat. And rather than serving it as a side dish I like to toss it with pasta and olive oil. This sounds amazing! I know what’s on the menu for tomorrow night. 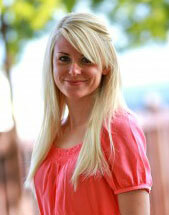 Congratulations on joining the Fresh Tastes blog team, Jenna! I love swiss chard but I really love beet greens which I think we also be awesome prepared this way. Yum! I have a big bunch of swiss chard in my fridge from the farmer’s market on Saturday. This sounds perfect! Hi Jenna! I’m a regular ELR reader so you didn’t have to twist my arm to get me over here to check out your new place. Congratulations! Love the swiss chard idea. I’m so doing that! Congratulations on the new gig Jenna! As an avid follower of ELR, I am happy to be able to read your delicious recipes on another site. I love your beautiful, fresh recipes. Congrats! I am trying to add this to my google reader! Do you get points for page views when I do that? I want to make sure they know to keep you around because I am reading:). I bet swiss chard is really good for you as well. Oddly, I’ve been making this for years with my CSA chard. It is also a great way to cook kale. If I have it on hand, I add a little white wine to the oil. My kids love this, too!